HomeBLOGS-Euro 2017 BlogsThree #Lionesses on Her Shirt? Three #Lionesses on Her Shirt? As the excitement builds ahead of the big semi-finals day and England prepare to face the hosts in Enschede, it hasn’t escaped us that both sides identify with the moniker ‘Lionesses’. 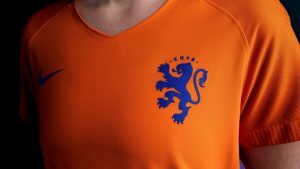 One difference, however, is in their logo, with the Oranje Leeuwinnen now wearing their own female version of the Dutch Lion on their chest. Should England’s Lionesses have three ‘lionesses’ on their shirt? Just before the tournament the Netherlands Women’s team revealed a new female version of the famous Dutch lion. That new lioness was such a simple change to an already world famous emblem I couldn’t believe no other team had already done this. To me it’s a wonderfully subtle way of giving the Mens and Womens teams a unique identity while sitting untied as two sides of the same coin. So what if the Lionesses had their own crest? What would that look like? The beauty of the Dutch crest is that it’s a simple evolution of the men’s emblem. And I felt an England Lionesses’ crest should have the same synergy with the traditional England badge but also capture the essence of the female team it represents. 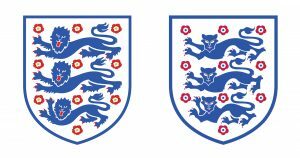 When you look at the current Three Lions crest it’s fairly obvious that the most telling difference between the lion and the lioness is the mane. But rather than simply removing it I wanted to give the lionesses a more distinctively feminine look, adjusting the the facial features to give the new lioness a strong and elegant face. I then took that that notion of strength and elegance to give the body a sleeker look. Smoothing off the fur and accentuating the sweeping lines down the lionesses back. Finally, I adjusted each lion to fit the traditional shield shape so that this new Lionesses crest sat as a genuine partner to the original Three Lions. For me this is really just the start of this creative process, I’d love to develop both crests further and really get the balance between the two right, presenting a strong, future-facing identity for both teams. What do you think? Good idea? Do you like Matt’s designs? Something we should get behind? Looks pretty cool to us and makes sense. Some might feel that it is important to retain the same imagery and ‘togetherness’ of all England sides, which we hear too. Though wouldn’t it also be a positive step to recognise the differences between the two programmes going forward? It doesn’t stop all staff/players involved and those supporting them from being proud of the achievements of ALL, just gives a bit of extra identity to our own ‘pride’. Great idea would be similar for Millwall . I found history in Estonia of the Lions of Tallinn mens national team i quickly converted that to Lionesses with the womens team and used the facts that the Lioness is the main hunter and protector of the pride and family so hell yes a good idea. I think it is a cracking idea! In the real world the lionesses do all the work hunting together as a great team while protecting the young, while the lions show up after the kill, push in because they are bigger and stronger, eat the food and drop off back to sleep again. Sound familiar? It just needs main stream media help to start it rolling! I think it’s a great idea! I’ve had to wait decades to see the Panini stickers. 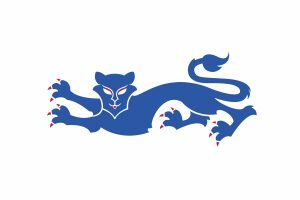 Lionesses Subbuteo next-with this badge,would be smashing.